QUETTA, Pakistan (Reuters) - July 2: Water levels are falling in some parts of flood-hit Pakistan, enabling rescuers to reach areas cut off for days, but more bad weather is on the way, officials said on Monday. 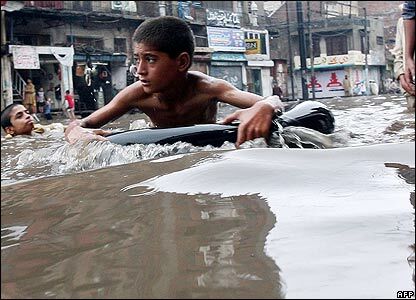 Pakistan has been battered by early rainy-season storms and flooding while severe weather has also affected Afghanistan and India, where about 65 people were killed in weekend rain. More than 650 people have been killed across the region in the past 10 days. Hardest hit has been southern Pakistan. A cyclone last week brought torrential rain and severe flooding to large tracts of mostly flat, usually desert-like, Baluchistan province. The cyclone and floods, the worst in Baluchistan since records began nearly a century ago, have affected up to 2 million people and killed about 110. About 250,000 people are homeless. The cyclone hit three days after ferocious wind and rain killed about 230 people in the southern city of Karachi.